The death toll has climbed to three dozen in Venezuela’s most violent protests in over a decade. The most recently-reported deaths were those of a 28-year-old woman named Adriana Urquiola, who was shot after getting off a bus that had stopped at a barricade set up by protesters, and a National Guard officer, who died after being shot in the neck. What purveyors of this narrative generally ignore are the actions of the opposition that have instigated much of the violence. Early on, the opposition protesters’ tactics included vandalizing government buildings and burning police cars. Retired Army General Angel Vivas called on his Twitter followers in February to use wires to “neutralize criminal hordes on motorbikes,” referring to government supporters. Days later, a man was decapitated by a wire strung across a Caracas street. 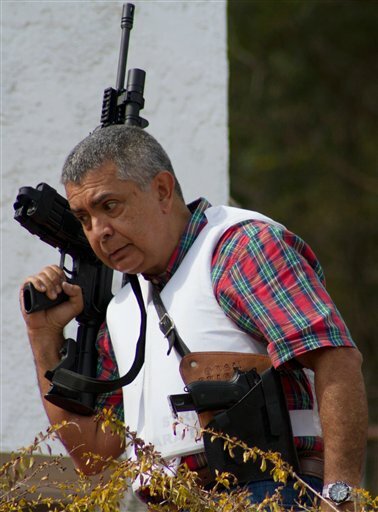 Maduro’s government subsequently issued an arrest warrant for Vivas, and the former general was photographed armed and wearing a flak jacket, walking around his home in Caracas. Despite the propoganda, what is happening in Venezuela is not a widespread effort by Maduro’s government to crush the protests by force. In fact, by some counts, more people have died at the hands of protesters than security forces. What we’re seeing is a violent, extremist, anti-democratic movement bent on ousting an elected government. Maduro’s repeated calls for dialogue with opposition leaders have been rejected. As Niño told Buzzfeed, “This is going to continue until we achieve our aim” – namely, La Salida, the removal of Maduro from power. Of course, not all the anti-government demonstrators are shooting cops and throwing Molotovs. However, the ones who are – and those who encourage them – should be condemned. Venezuelans have legitimate reasons to be frustrated with their government, but those don’t excuse the use of violence.